Established in the mid eightits, Beraca Vocational School was the result of a vision given to a Haitian Christian man called Kenny Vil (now Pastor Kenny Vil). Kenny had the opportunity to leave Haiti; it was the dream of the most Haitians to do so back then; to leave and escape the poverty that faces most Haitians day after day, and Kenny had the money, the education, the skills and ability to find good employment in the USA. He would have had no problem at all in obtaining a visa. But he had a vision from God. Kenny looked around the streets where he lived in the peaceful little village of La Pointe and notice the young people, so many of them, hanging around all day, playing games, or just sitting around doing nothing. It wasn't that they didn't want to work, they genuinely did, but there was very little paid work around to do. Some of them may have attended school for a while and could perhaps read and write, but apart from that many had no form of higher education and certainly none that would enable them to take on work that required any amount of practical skill. This weighed heavily on Kenny's heart. He saw potential in these young people whose lives were wasting away. The vision god gave Kenny Vil was to start a vocational school. A place where young people could learn valuable skills and be equipped to take on useful employment or even start small businesses of their own. Kenny began to look for financial assistance to enable him to begin to develop the piece of land purchased from the adjoining Beraca Baptist Church. On sharing his vision with Christian aid agency, TearFund, he was granted funding to commence work on the first classrooms and workshops that were to form the beginnings of his school. TearFund continued to give annual grants to Beraca Vocational School to aid its development and to pay teachers salaries, and as the school developed so the demand for places grew. TearFund began sending what used to be know as 'Task Force Teams' to the school to add extra classrooms to and expand its training programmes. Andrew Brooke led the first of these teams in 1990 and went on to lead a further three teams up to 1996. 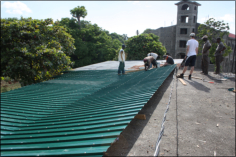 More recently, the charity has helped to fund the building materials, and labout needed for the construction of a new library annex and the replacement of a large section of the main building roof. The school is, however, like many institutions and establishments all over Haiti, presently experiencing dire financial crises, High unemployment, rising food/fuel prices and high cost of living make it very difficult for many students to find the money to pay the annual tuition fees and to complete the full three years of their training. Often students from poor families attend the school but are unable to pay their fees. The school will often accept these students on compassionate grounds, but this often leads to teachers going for long periods without full wages and in some cases with no wages at all. Under such recent circumstances, Hands of Hope have been able to intervene, and have provided a small emergency grant so that the teachers have been provided with some wages in order for them to meet their own living costs. "Thank you for your help with the school's financial needs and for your help with our tools - you have helped to keep our school running. We pray that you will be able to continue to partner with us in the training of Haitian youth." Hands of Hope will continue to give small grants to the school, but prayer is needed as the Directors try to formulate a plan for their future. Please pray that God will give them and Hands of Hope a clear vision to direct us as we seek to move forward with Him.